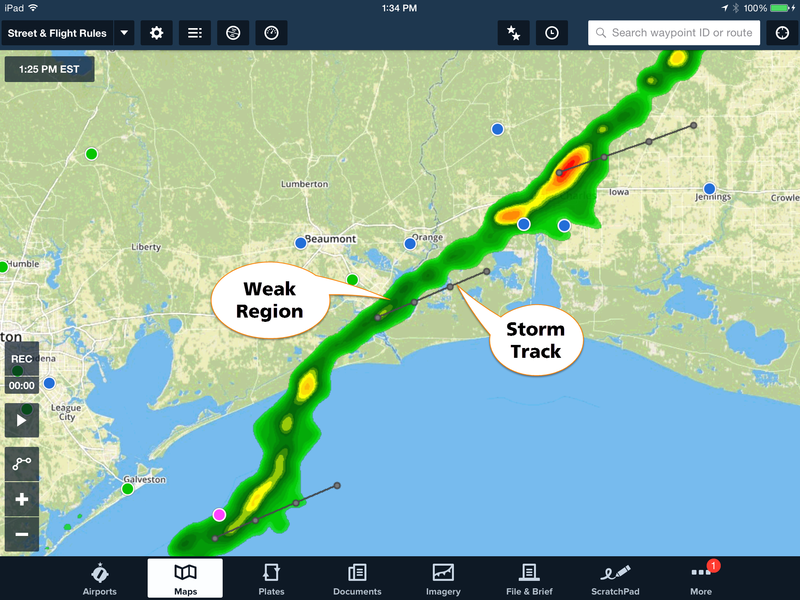 Of all of the weather layers available on the ForeFlight Maps view, the radar mosaic is likely the most frequently viewed. With such a high glance value, even the most inexperienced pilot can quickly identify where the significant adverse weather is located and plot to avoid it. This is because radar reflectivity (or the amount of energy returned to the radar) is strongly correlated to the size and concentration of the hydrometeors (rain drops, snow flakes, hailstones, etc.) present in the radar’s view. Large raindrops or hailstones are indicative of intense updrafts and a high probability of severe or extreme convective turbulence. So it’s important that the radar mosaic be depicted in a balanced way that engenders caution without over-warning the pilot when the weather is benign. To that end, we’ve made a subtle change to the Internet radar color map as shown below. Comparison of new and old Internet radar colors. 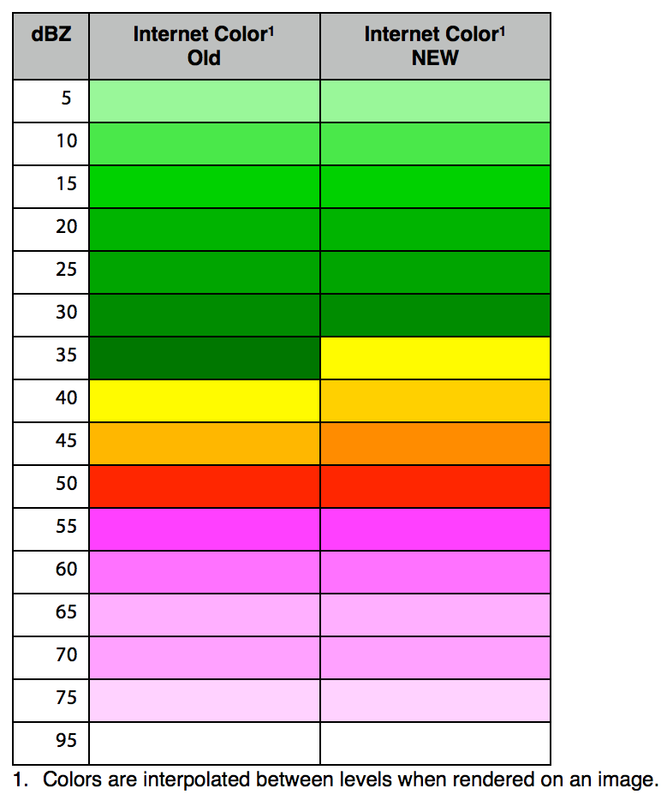 The primary goal was to modify the mid-range reflectivity (dBZ) values. This provides better awareness during the early stages of convective growth that were previously being shown as a dark green. Consequently, we shifted yellow and orange by 5 dBZ. For instance, yellow used to begin at 40 dBZ, but now it begins at 35 dBZ with orange beginning at 40 dBZ. We kept red at 50 dBZ and added a darker shade of orange to fill the void. This subtle modification won’t significantly change the look and feel of active thunderstorm regions, but will help highlight an area of developing convective weather much sooner. For example, take a look below at this thin line of precipitation just east of Beaumont, Texas. There is a distinct “weak” region in this line just southeast of Beaumont. This part of the line is characterized by mostly green contours with just a hint of yellow. At a quick glance, it may be very tempting for a pilot to flight plan through this thin convective line at this weak region. Take notice of the storm track that has also been depicted within this part of the line. Storm tracks shown by the straight lines denote distinct cells that have been identified by the NEXRAD software algorithm. In this case, this part of the line was beginning to strengthen and was rapidly becoming a significant threat to aviation. As a comparison, below is the same line with the new color map applied. Notice the area looks much more pronounced given the warmer colors of yellow and slight hint of orange now being displayed. While there are still a few “soft” spots along this line, the newest depiction represents the threat more accurately. Notice, however, the more intense cells along the northern and southern extent of this line don’t change appearance significantly preserving the original ForeFlight characteristics. 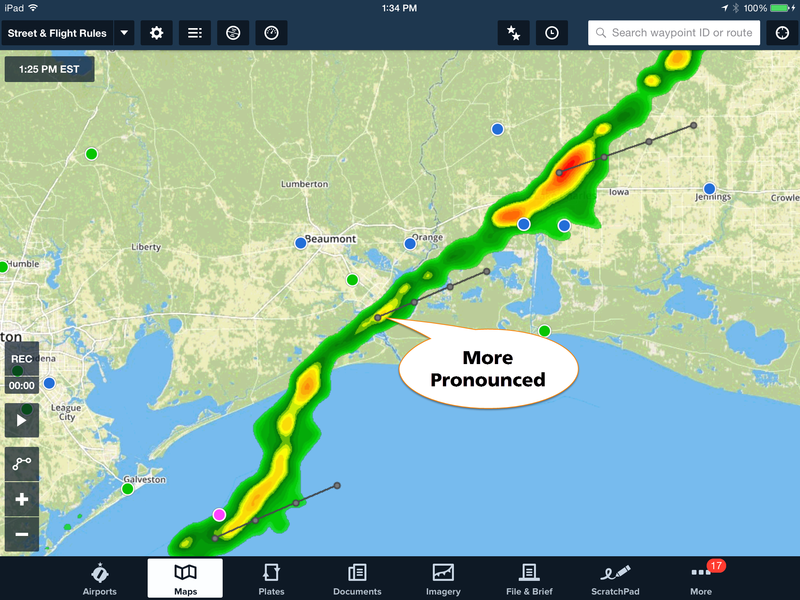 This entry was posted in Weather and tagged aviation, flight planning, foreflight, iPad, Weather by Scott Dennstaedt. Bookmark the permalink.